Planting cover crop mixtures is very popular right now. The practice has a feel-good aspect about it and, buoyed by the ecological theory, it fits with the current “mimic nature” strategy of agroecologists. In a previous blog post I demonstrated how difficult it is to do research on cover crop mixtures. Although difficult, there are intrepid researchers investigating this practice so I decided to see what they were finding. The results call into question the value of cover crop mixtures, as in many situations a monoculture cover crop would both produce more biomass and provide other desired services as well. Do ecological theories of natural biodiversity apply to cover crop polycultures? Photos left to right: A. Losi & A. McGuire. My last post is related to this; there, I showed the hypothesis that diverse polycultures exhibit transgressive overyielding, is not supported by research results (i.e., polyculture yields do not exceed yields of their best yielding component when it is grown in monoculture). But does this apply to cover crops? Might polyculture cover crops give some benefit over monocultures? For if an agricultural practice exists that is well-suited to mimicking nature, it is a cover crop, which is not harvested like a food crop, and thus is easier to manage as a mixture. Cover crops are planted specifically to provide what are now called ecosystem services; benefits like suppressing weeds, recycling nutrients, and supplying nitrogen. First, a little about why using cover crop polycultures could be beneficial, some of which is covered in this eXtension webinar by a team at Penn State. The theory is that a mixture (polyculture) of species will interact in a complimentary way so as to produce more biomass and other ecosystem services, than one species planted by itself (monoculture). The theoretical relationship is shown in this graph (Tilman et al. 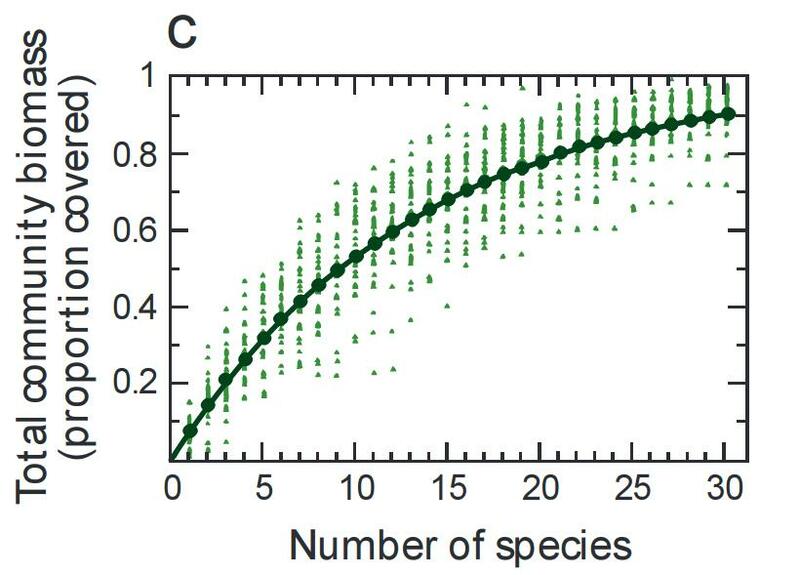 2014) where productivity increases with species diversity (the small triangles are individual trials and the large dots connected by the line are the average biomass yields for each level of diversity). If this would work with cover crops, then cover crop polycultures could do a lot of good. 1 Results for each comparison/year; monoculture biomass production greater than (>), equal to (=) or less than (<) that of the best polyculture. In this post I’ll focus on productivity and stability of production. Biomass production is important for cover crops because it is the biomass that adds organic matter to the soil, forms a protective cover over the soil, and suppresses weeds. It is important not just for itself, but it is a major factor in providing some ecosystem services. Therefore, it is significant that in all of these studies, the biomass production of the various mixtures was always equal or less than at least one of the monocultures – no evidence of transgressive overyielding was reported. In Wortman, the mustards dominated the mixtures, and mustards in monocultures were twice as productive as the legumes. This is common in intercropping research; one or a few species dominate the other species. Miyazawa found yield differences between the mono- and polycultures in only one of four years, and then the mixture was no better than the best monoculture. All the studies reported “overyielding,” where the polyculture biomass yields were greater than the average of the monoculture yields, but as concluded in the Cardinale et al. (2011) meta-analysis, transgressive overyielding, where the polyculture yield bests the best monoculture, is not a realistic expectation. One further note, although this is not a large number of studies, the results match the results from a much larger body of evidence reviewed by Cardinale et al. which was highlighted in a previous post. Ecological theory also says that mixtures will have more stable productivity over time than monocultures. However, Wortman found no differences in stability between the two cropping strategies and Smith et al. found stability higher (less variable yields) in buckwheat and cereal rye monocultures. The Wortman group created an index that combined yield and stability and found that in both years, the top ranking plots for this index were always monocultures. While this is interesting, it is far from conclusive in terms of stability as both studies only had two years of data. With more years of data, the mixtures, because they have more species included, might better adapt to varying weather than any one monoculture. This hedging your bet strategy of using mixtures might be a benefit in regions with highly variable weather, especially precipitation, like the Great Plains, but would probably not be worthwhile under irrigation. The short time that cover crops are actually in the field also may work against ecological benefits of mixtures as they were mainly hypothesized for mixtures of perennials, and some research shows that they strengthen over time, which here means several years. So, if you are growing a cover crop, and want to get high biomass production, it pays to plant the best crop as a monoculture. Since most cover crops are also crops, (probably because those species have been improved over time, i.e., less weedy characteristics, high yield, etc.) you probably know which crops will do well in your fields. In addition, because one benefit of using a cover crop is to add diversity to the crop rotation, you should choose one that is not normally in your rotation. Here, your choice may be limited and you may choose to plant a less-productive crop, still in a monoculture, for your crop rotation. For a highly diverse polyculture, you get all your diversity at once, but what do you plant following a 22-species polyculture, most or all of which are also crops? Your available diversity in time has been used up. The research results for biomass production favor cover crop monocultures, however, there are other considerations. You can grow cover crops for weed suppression, nutrient recycling, and if legumes are grown, for nitrogen supply. I will address these other “ecosystem services” in my next post. Thanks to Tara Zimmerman for insightful comments on drafts of this post. 2 thoughts on "Monoculture vs. Polyculture Part I: “Straight up” beats “cocktails” for cover crop productivity"
Thanks very much for this valuable info. It is a perfect example of how much research needs to be done, continuously, to validate some of the permaculture “universal truths”. Nice work.